My initial response was skepticism precisely because the last sentence flies in the face of the paradigm I was raised in. I needed answers, so I began to wrestle and process. Suddenly, the picture was markedly clearer and I began to understand the paradigm I was raised in. Without even thinking, I knew that converting the Jews to Christianity is decidedly NOT what I want to do or have any part of. As readers of my blog can attest, there is much in Christendom that needs reforming because it is radically contrary to God’s everlasting and unchanging Word. Converting Jews to eat ham sandwiches would be a travesty. We burn our own at the stake over doctrinal differences!! So, if ‘evangelize’ means to share good news, what happened? I don’t fully know, but I suspect a spirit of religion, disguised as zeal, began to justify any means necessary to bring a new convert in so the scalp could be hung and gun notched. God must have been overjoyed! As I continued to ponder the eighth article, I recognized that most dissenters focus on the last sentence without studying the first two. We will stand ready to give an answer for the hope of our calling, willing to share what we believe with anyone who desires to hear; this is our responsibility. Please. What part of that sentence says that we can not share why we do what we do and in Whom is our hope? In fact, the sentence accurately reflects the fact that we have a responsibility to share, however that doesn’t give us the authority to break down boundaries and force ourselves on anyone! Jew or non! Yet we acknowledge there is a difference between giving answers to questions asked and trying to convert another to our way of understanding and practice. 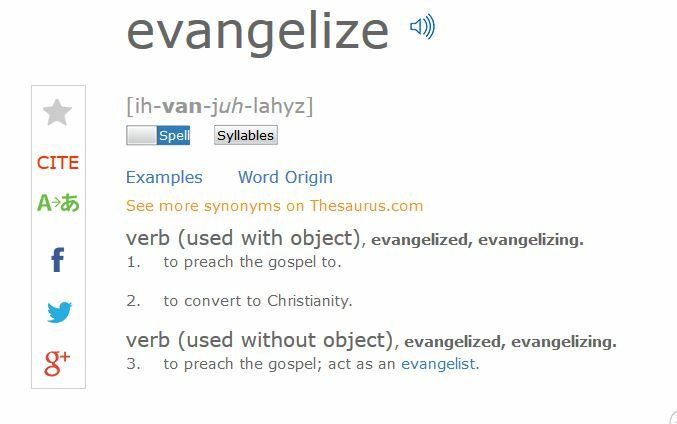 There it is: The definition of evangelize is to ‘convert’ to our way of thinking. Generally speaking, as previously witnessed, our way of thinking was Christendom. We are changing, growing and unlearning many things. Fact: I/we have not arrived yet and have much yet to adjust in our paradigms before we are fully in alignment with Scripture. If we haven’t arrived and we know that some things are yet subject to change, we know that we are moving toward the Torah, why would we seek to impose our own changing belief system on brother Judah? Maybe, just maybe, the wisest thing we can do is to live out and share what we are learning and the hope we have in Yeshua while letting the Spirit do what He wants to do in their lives! Prophecy promises that Judah will recognize the Messiah at the appropriate time. For some that may be sooner than later, but it doesn’t require of us results. It requires of us that we simply live as witnesses who are ready to give an answer as often as opportunity presents itself! This means as you are a bus driver or carpenter or banker, etc… as you are going about your life doing those things, teach. Essentially, the sharing/teaching is a natural outflow, not the primary focus. These are a few of my thoughts. Please remember, as it states on the upper right, this blog does not necessarily reflect BYNA, it is a reflection of my thoughts. I.e., I am happy to discuss my perspective, but if you want to discuss BYNA’s on this issue, I recommend talking to the Elders. This entry was posted in Debate/Discussion and tagged Articles of De, christendom, evangelize Jews, Ken Rank, paradigm, religious spirit. Bookmark the permalink. very good point you’re making and how you got to the conclusion clarifies a huge deal to those who work by own works and try to force others to think their thoughts on them without the authority of the spirit of Yah! thank you Pete for the share of your research. Thank you so much for beautifully articulating my very similar thoughts. This topic has caused much discussion and you have given many much to pray about! Thanks Pete! I too want to share MY thoughts on “evangelize” even though you have already shared most of them. Matt 28:19-20, I believe should read: “As you are going, disciple….teaching them to observe all that I commanded you.” “Make”, is not in the greek. I believe these verses mean that as we are living our lives as best we can according to Torah, teach others to do the same primarily by example. This verse in my mind echos Duet 6:7 “You shall teach them diligently to your sons and shall talk of them when you sit in your house and when you walk by the way and when you lie down and when you rise up.” This is based on relationship. It is not a mandate to go knocking on any ole joe’s front door. 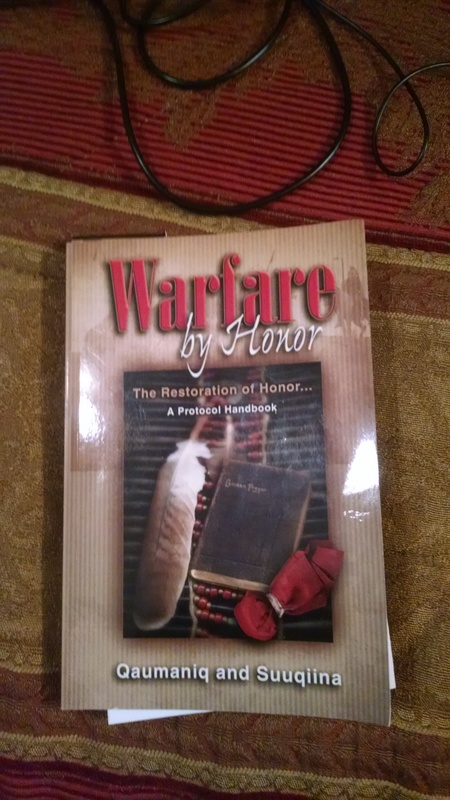 I am also currently reading the same book “Warfare by Honor”. It is a MUST read for all believers and helps us understand what our boundaries are with people and how we are to respect them through honor. This book also talks about Protocol. It says, “Protocol insists on maintaining the dignity or honor of a person or group of people no matter what their place or status may be.” and “Protocol is the voice of honor” What a HUGE difference this would make if believers would understand just this one principle. For far too long Christendom (to use one of your favorite words Pete!) has crossed many boundaries without honoring first, without respecting first and earning respect first, without asking permission first, without building relationships first thus earning the right first. Why? Because it is a slow process that requires sacrifice, investment of time, and hard work. There is a question that is asked in the introduction of this book. “If you were the only version of YHVH people would encounter on the earth, what would be their definition of Him? Could we become this version of YHVH in the earth? It is worth every effort!…..and when we do, we will be expressing the ultimate way to “evangelize” anybody! I also had a red flag when I saw the word “evangelize” but since returning to my very evangelical world and showing the document to a few men who are taking baby steps in our direction I find it is less a problem than I thought it would be and more of an opportunity than I expected. It’s true this is the point they flag, but almost right away they acknowledge the sad history and I sense they are asking for a way to embrace the idea themselves. When I explain that since we are the prodigal coming home, we have no business instructing our older brother, our job is to learn and abide by the rules of the house. Leaving the father to deal with the older brother and his attitude. An older brother who is not lost, but very much in the house and not used to having a naive younger brother around. Upon this explanation I see shoulders settle and recognition on their face. I now think the word “evangelize” in that document is God appointed. Thanks for your sacrificial role. Hence the problem with “religion” (and it’s attached evangelism) as most of us know it. It’s a set of rules and regulations imposed on others and nothing validates us more than replication. Since coming to Torah I’ve come to realize, the Fathers instructions were never intended to be a religion in the way we understand it. In fact, I would contend a religion (along with its specific rules) is designed as the path of the disobedient to facilitate order among a people with a bent toward disobedience. The instructions given to us from a loving Father are to be a lifestyle of naturally bearing the fruit of the Spirit because His instructions are firmly planted in our innermost being. It’s about living among and loving each other in a way that pleases our Creator. No need to impose our particular flavor but to encourage His flavor which cannot be fully seen or understood by any single entity. It’s really pretty simple. It’s not about how one ties their tzit-tzit or the way, or if, they wear a tallit nor is it about a particular ceremony on Shabbat or any other of the feast days. It’s about simply walking in love with Yehovah, our fellow man and walking the commandments of our Father (imperfect as we all are in it). It’s about gathering to share to take care of the weak and marginalized among you. It’s about compassion and love that will cause one to risk his own life even for those who can’t see what he see’s. It’s about understanding that because of our hope of resurrection (deliverance from this corrupt existence that Judah shares in) we understand what’s really important, and what’s not, and simply walking in it one step at a time. That religion is the practice nicolaitans,to be repented of that we may overcome it. Exactly, Pete that is why I concluded with what we all must do, of all things is to overcome. I so appreciate the comments above and wold love to meet some of those people. May I take us in a slightly different direction for consideration of this topic? I believe it is Brad Scott who makes this claim that there is nothing new in the New Testament merely commentary on the Hebrew Scriptures. Also, if we keep in mind that things are the same now as in history from God’s perspective, we need to ask a question or two. Was Israel called or chosen in order to “evangelize” the nations as we understand that word today? Do we see an organized effort to go to nearby nations and impress them with their God and His instructions on how they should live? Certainly we are familiar with the ”chosenness“ of Israel and therefore one would expect that there would be clear indications of how they were to go about their proselytizing. I am not aware of such overt methodology. However, I do see that very nation which was to be a light to the nations, was judged due to its failure, not to evangelize, but to live according to the instructions of God so that the other nations would observe a discernible difference in the way they lived, worshiped and were blessed, and come to question why their experience was so different. I am reminded of individuals who “saw” this very difference and joined with Israel, even as foreigners or Gentiles – Ruth, Naaman, Rahab, Uriah, Ittai as examples. Isaiah 58 is a wonderful chapter on true fasting from God’s perspective. Here we see Isaiah chastising Israel for their failure to exercise the most basic of functions in terms of loving their neighbours – caring for the vulnerable – and in such reprimand, states that a return to obedience will result in their light once again shining to the nations. Coupled with the foregoing, is of course, the admonition to “love our neighbours as ourselves.” It is, I believe, out of the demonstration of that love, that others see the ways in which our lives – free of worry, concern, guided, blessed, fulfilled – are significantly different from the mainline culture models of today and wonder what is different – just like Israel was supposed to example. Could it be, that in our North American Christian context particularly, there is little, if any, discernible difference between those who follow the Messiah and those who do not, that there is little demonstration of God’s power and instruction with which to be observable by the “foreigners”? Maybe we need to examine ourselves and ask how we can live more faithfully to our Father’s instruction and see how He will use us in those He is drawing to Himself. As Rico always says ‘what would a Jew convert to?’ Why would anyone convert a Jew? They would simply recognize messiah Ben Yosef. They were never divorced anyways. So I find no fault in that article. Yeshua doesn’t say “go into all the world and don’t say anything UNTIL/UNLESS they ask you questions…” Rather, Yeshua commands us to take a proactive approach, offering the Good News to people regardless of whether they want to hear about it, and to, if need be, suffer persecution for having shared an unwanted message. If I may? The Great Commission says “Go!” in English, and so we “GO!” But in the Greek, the underlying word for “go” is a participle, it is “going.” The idea then, and you can confirm this with pretty much any Koine Greek scholar, is “as you are going.” In other words, “live and live in a manner that reflects the character of the Lord you serve.” The second part of the commission is to make a disciple… a student… not a convert. We cannot force another to learn, we can’t “make” somebody be a student, they have to WANT to be one. So I am not saying we aren’t to be proactive… but perhaps not as forceful with this as we have been raised to be. That leads to one last thought this morning… force. If you look up the word heresy in the Greek (hairesis G139) you will find that it is defined by Thayer and Liddel-Scott as, “to storm a city, e.g. to take by force.” The modern definition of heresy (disagreement with the orthodoxy) and the Greek word found in our bibles does not have the same meaning. The false teachers Peter wrote of (2:1) that brought “destructive heresies” were “forcing false teachings” on the believers in Yeshua. Understanding this, then when we try to force somebody to believe or think like we do when they are not seeking, then we are on the thin line of heresy. I think that is why Yeshua said, “He that seeks will find.” If you aren’t seeking I can’t help you… if you aren’t asking a question, my answer would fall on a deaf ear and I risk casting pearls before the swine. And that isn’t calling somebody not ready to hear a pig… that verse simply means not to cast out God’s treasures to somebody who doesn’t understand how to not treat them as “common.” A swine treats all food the same. It seems inconsistent, at best, and even misleading … maybe even manipulative … to use Biblical definitions in one situation … and then use modern secular definitions in another situation. Here are the examples. 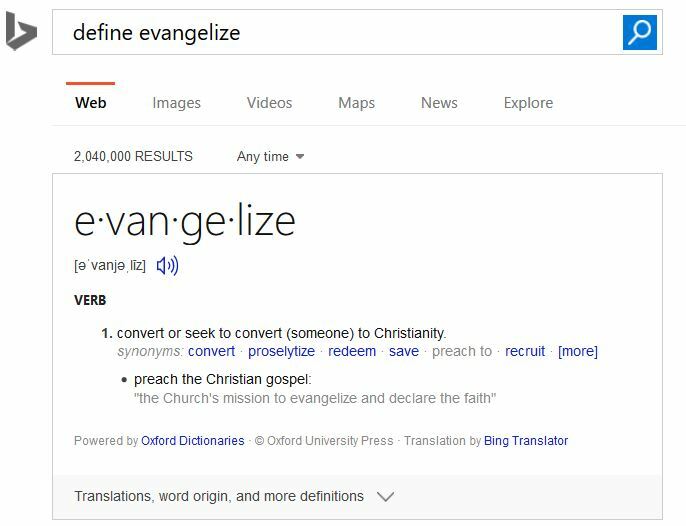 You, Ken, and others, have changed the Biblical definition of the word “evangelize” (evangelism, evangelist), and accepted a modern secular definition. 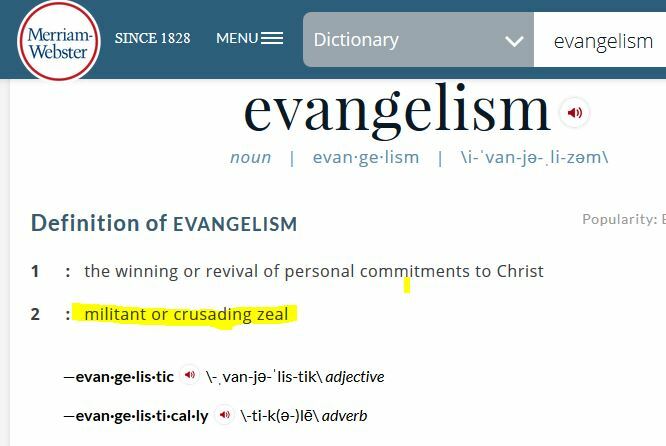 To use your wording, “(Your) definition of “evangelism”, and the Greek word found in our bibles does not have the same meaning.” You are claiming that it means converting someone to Christianity, even alluding that it means that the evangelist is forcing someone to convert. For the people throughout history who have acted this way, that is wrong … but it still does not change the biblical definition. If what you are saying is true, then Paul was teaching Timothy … when he told him to do the work of an evangelist … that he should be converting people to Christianity. I realize that there are Christians who might support this interpretation, but are there any involved with “our walk” who would say this is good honest Biblical interpretation? I can’t imagine. 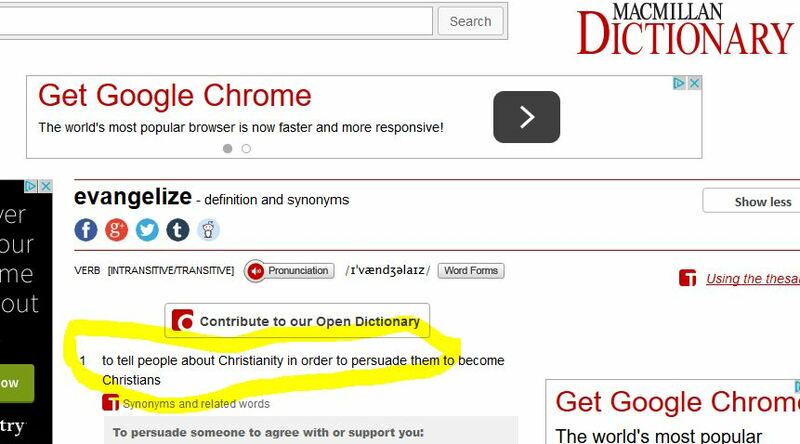 But with the words “GO” … or “heresy” … you go back to the biblical definitions. Who gives you the authority to use a Biblical definition “here” and a modern secular definition “there”? Please realize that I am NOT saying that you are trying to mislead people. No, heaven forbid. But that is what you are doing. I can’t imagine that you would want to do such a thing. I am just trying to get you to see that this is the fruit. I can’t imagine that anyone would support changing the meaning of Sabbath to Sunday … unless you are in the Roman Church. I can’t imagine any folks in our circles who would adhere to the doctrine that the new definition of Israel is “The Church” … but only when it makes references to blessings. We’ll leave physical Israel with the curses. Doesn’t make much sense, does it? So why do we do this with the word evangelism? Doesn’t make much sense, does it? But that’s what happens when someone attempts to change the definition of words used in the Scriptures. Tom, what you fail to acknowledge is who this document is written to. If you think they will go to Paul’s letter to Timothy to define the word ‘evangelize’ over 1700 years of experienced ‘evangelism’, then you are quite naive. As to ‘go’ and ‘heresy’, Christendom should know this, but just like their demonstrably wrong record on ‘evangelize’, they don’t which is the reason for broaching the topic. For the very few that I have heard take exception with the 8th article, almost none of them take into account the whole article, never mind the while document. Sad. Brother, I love you. Let the pot settle. Pete, with all due respect … with all my love … I think you are sadly, so very sadly mistaken. If you are talking about Ken’s article, it was definitely written to his United2Restore group and I can only imagine that the vast majority of those people would call themselves believers. It was basically an article/post that many people walked away from, with the idea that he was saying that we should not reach out to the Jewish people with the Good News of Yeshua as the Messiah. We can discuss the wording … I spent hours discussing it with Ken … but that was the message that many people got. As Barry Phillips said, we have to be more concerned about how someone hears us, than what we are actually saying. Ken’s article has caused division and disunity. Maybe you are not aware of it because you gave it a thumbs up. They are going to be reluctant to contact you. I tried to give people another way of looking at things, and in so doing, I have received emails and messages from people in Europe, Great Britain, Canada and the USA. Keep in mind, these are BYNC minded people … people who are wanting to work to help regather Ephraim … but they will not join with us as things stand. That should speak volumes. If you are talking about the Articles of Declaration for BYNA, again, I believe you are mistaken. You, and others might think that those articles were written for the Judah side of our nation. But haven’t we had a discussion about timing and order of things? You even mentioned about the men who went to talk to the descendants of the Indian tribal folks down in Florida … because that was the order of things of how we got here. Maybe I am not reading things correctly, and I am open to someone pointing this out, but it seems that YHWH has to call and gather Ephraim, before there is an Ephraim to be re-gathered to Judah. You might think that the articles are written for Judah, but they are actually written to Ephraim first. Ephraim has to be called and regathered. These Articles … with all their excellent points … are causing division instead of unity. As I have said, there is an easy fix … an easy way to reword things. This should have been done from the outset. I gave Ken and Frank the submission, but the parchments had already been printed and there was a ceremony to put on. They were not willing to put things on hold because of the schedule. In my opinion, this was an error. Many people agree with that. It was a real surprise for me to read your article about this subject.For days something in my mind was going on and just yesterday evening I started with writing my thoughts in words…You have to wait a bit longer before I can publish it on my blog. I so feel a very very strong experience deep inside of me of Avinu’s Ahava for His beloved people, it is like a fountain what is going on and don’t stop. I am so thankfull of His love to us all.My prayer is that everybody will receive that very lovely experience what we really need when we grow together with all our diiferences and different view. Be blessed Pete and your household! Greetings from the Netherlands, shalom…. Enjoyed hanging out with Yanathan last weekend. I think he’s in some of the pics I posted…. Seems to be enjoying his trip. Shalom Pete, and all. As is often the case, I greatly appreciate your scholarly way of looking at a situation. I am going to give you all a bit of a different way of looking at things … a perspective through life experiences that I don’t think anyone else affiliated with BYNA has had the blessing of experiencing. Hopefully, you will agree that it, too, is scholarly! First, I am reminded of what Barry Phillips said in Florida. It was something like, “It is not as important what you say … as it is how the person receives it”. And this is the huge problem of using the word “evangelize” in The Articles. It means too many different things to too many different people … especially when there is a footnote in “The Articles”, to Ken’s article on United 2 Restore … an article that was very confusing at best … and very divisive at worst. Since I responded to Ken’s article, I have received emails from people all over the world … some of them I have never met … thanking me for trying to set the record straight and praying that this divisive wording and mindset would be removed far from us. And yes, it is a mindset. Let me ask how many people out there have ever shared the good news with an Israeli person … a Jewish person? Let me ask how many of you know an Israeli Jewish person who is eternally thankful that someone loved them enough to “evangelize them” … “proselytized them” … “told them that they needed to be converted”? As for me and my house, we know of countless individuals … we know many personally. When you look at things from that perspective, you might be a bit hesitant to say that we are not supposed to “evangelize” the Jewish people. On a related note, please realize that our family stands opposed to the idea of Jewish people converting to Christianity. It is something that we struggle against, every time we are in Israel. As you can see, I chose to use the words that “we” now avoid like the plague. The problem is that these are the words that are in our English Bibles, and if we are not going to use them, then we better come up with another word. In Isaiah 6:10, speaking to the Kingdom of Judah, our English Bibles use the word “convert”. Sorry Rico, but that is the translation. Jewish people need to be converted. Yes, it comes from the Hebrew word “shoob”, #H7725 … usually meaning “to turn”. Some of us are familiar with the word “Teshuvah”. If you don’t like telling Judah that they need to be converted, tell them that they need to make teshuvah … just like Isaiah. In James (Yacob) 5:19-20, we read the following: Brethren, if any of you do err from the truth, and one convert him; Let him know, that he which converteth the sinner from the error of his way shall save a soul from death, and shall hide a multitude of sins. Now, tell me why this idea of converting someone is a bad thing? Again, if you don’t like the word … if you don’t like the history that comes along with the word, then choose another translation … but you can’t get rid of the meaning!!! I am well aware of the history, but that is simply a “straw man” that has been set up. No one that I know of is talking about the horrendous history and practices of some of those who claimed to be Christians. The problem is that we have let the pendulum swing so far that we are now teaching that we are to only say something if we are asked. Where is there support for that in the Scriptures? If that is the case, then Peter was wasting his time in the second chapter of Acts, telling all those observant Jewish people … those who were there observing the Feast of Shavuot … that they needed to repent and be baptized in the name of Yeshua the Messiah and receive the gift of the Ruach Ha KOdesh! I don’t think that those three thousand people would take the same position that everyone here seems to be taking. And now to the word “evangelize”. Again, if you don’t like the word, find a new one … but you can’t get rid of the meaning. Pete, you did a good job looking up the word in some secular dictionaries, but did you see everything that the Scriptures have to say about the word? In a similar way, I could go to different dictionaries and look up the meaning of the word “gay”. I’m not that old a man, but when I was younger, it was still a good word, but who would use it that way now? We have to be more concerned with how the reader is going to interpret things … and so far … many people have taken things to mean that it is not only wrong to share the good news, but it is forbidden. You can’t say that people are misinterpreting things, because they are hearing it from different angles. Check the U2R website … listen to how Hanoch sets the parameters for discussion … read what the Commonwealth of Israel has to say … and listen to what our own leaders say about not seeing the Jewish people as people who need to be saved, but rather need our love and support. I am here to submit that the most anti-Semitic thing you can do, is to refrain from sharing the good news of Yeshua … and to teach others to do the same. There are many from Judah who would agree with me. And that is one of the problems. It seems that we are only using the filter of Hanoch or Nehemiah … we are not consulting a good cross section of the Jewish Israeli society. It seems that we are letting them dictate to us, what can be said and how it is to be said. Very dangerous, especially when there are numerous people who “follow” Hanoch and Nehemiah … and have ended up denying that Yeshua is the Messiah, and have “converted” to Judaism. Somehow, that word is acceptable when things are going in that direction. Heaven forbid!! Back to the word and the concept … evangelize. In Acts 21:8, Paul/Shaul … the rabbi … went in to the house of Phillip the evangelist. Nothing deep here, but the word is used, and we don’t see this rabbi rebuking him for being an evangelist … meaning that he evangelizes people. Listen to what the good rabbi tells Timothy, in II Timothy 4:1-5: I charge thee therefore before YHWH, and the Master Yeshua Messiah, who shall judge the quick and the dead at his appearing and his kingdom; Preach the word; be instant in season, out of season; reprove, rebuke, exhort with all longsuffering and doctrine. For the time will come when they will not endure sound doctrine; but after their own lusts shall they heap to themselves teachers, having itching ears; And they shall turn away their ears from the truth, and shall be turned unto fables. But watch thou in all things, endure afflictions, do the work of an evangelist, make full proof of thy ministry. He is telling Timothy to do the work of an evangelist. Again, pick another word if you want, but I submit that we are to follow Shaul’s example, as he follows Messiah’s example. Last, we have the position of an evangelist as being part of the popular “five fold ministry”. Ephesians 4:11-13: And he gave some, apostles; and some, prophets; and some, evangelists; and some, pastors and teachers; For the perfecting of the saints, for the work of the ministry, for the edifying of the body of Messiah: Till we all come in the unity of the faith, and of the knowledge of the Son of Elohim, unto a perfect man, unto the measure of the stature of the fullness of Messiah. If we are going to encourage someone against evangelizing with words, then to be consistent, we need to forbid sharing the prophecies that show the reunification of the two houses of Israel. Is anyone going to say that we should not be sharing these things? Of course not! Then you can’t say that we are not supposed to evangelize either … not to mention teaching, having elders or shepherds, or apostles. Do you see how absurd this is? We have taken a Biblical word from our English Bibles, and we have accepted the definition to be the misuse, abuse, and misapplication of that word. Heaven forbid. I submit that we correct the errors and redefine what evangelization is supposed to be … not get rid of the word and the good deeds, simply because some/many have used it in an erroneous way. I am reminded of someone approaching Dwight Moody and telling him that he thought that his method of evangelizing was in error. Moody asked the man what method he was using, and the man answered that he wasn’t using any particular method. Dwight Moody replied, “I like my method better”. So I ask you all, what method are you using … according to the Scriptures? To sit back and say, “I’ll just wait for a Jewish person to come up and ask me about Yeshua” … I think you will be waiting for quite a while. Again, I can give you names and contact info of numerous Jewish Israeli people who are forever thankful that someone reached out to them. When you have experienced that … when you talk to them and get to know their stories, you would never ever even consider using the terminology that we should not be evangelizing the Jewish people. I whole heartedly disagree with the brother who said that he thinks that using the word “evangelize” is “God appointed”. As I mentioned, it has already caused much division. I just recently heard of a leader from a congregation who has said that he can have nothing to do with BYNA because they stand against evangelizing the Jewish people. Do not think for one minute that this brother is in favor of “swords, fires, torture, maiming, starvation and other extreme measures so they could ‘show the love of Christ”. No, he is defining things as he understands them, and we are not doing a good job of clearing things up for him and others. Unfortunately, no one seems willing to talk of Judah’s persecution of Christians as recorded in Acts either. Until we’re honest and get everything on the table, how is it possible to have an honest relationship and both sides move closer to Messiah? I too agree that we need to let our light shine to all around us (there is no difference between Greek and Jew…). We should always have, on our lips, words of life. But I believe we can both agree, a “militant” approach (as some see evangelism to be today) is not prescribed in scripture. If they receive you, stay and preach. If they reject, move on. Sometimes rather than throw the lure in the pond, we should check the water temp to see if it’s time to even be fishing. Amen and amen Tom. I read your comments on Ken Rank’s blog a few weeks ago regarding this subject and I whole-heartedly agree with you. I wrote some long comments addressing an earlier version he had posted with supporting scripture. It seems like this all stems from the belief that Yeshua only came for the House of Israel/Ephraim, which is not scriptural. I have seen this same position in rabbinical teachings. Ironically, I even used the exact phrase ‘the pendulum has swung too far’ in favor of Judah (and debasing Christendom – of which most of the Hebrew Roots believers came from). I think it will turn many off from being a part of BYNA. Sure, there is a are Christians that have abused the biblical concept of evangelism, but certainly not all. As well, I don’t understand why all the fear, as the people these sites and this organization are addressing are those who are trying there best to do thing biblically! By setting their intentions and aiming for the lowest possible shelf, BYNA does not inspire Yeshua’s followers to rise to the their calling, but in fact squelches the Spirit many may have received to plant seeds and share the light of our Savior. I believe a rabbi we know as Paul once said (in a letter to Jews living in Rome while explaining Messiah) “all have sinned and come short of the glory of Elohim”. Maybe he got that understanding from 2 Kings 17:19 Also Judah did not keep the commands of YAHWEH their Elohim, and they walked in the statutes of Israel that they had made. 20 And YAHWEH rejected all the seed of Israel, and afflicted them, and gave them into the hand of the plunderers, until He had cast them out from His presence. One has to ask, “Who is the “seed” of Israel?” Is it not the twelve tribes including Judah? Yea, we’re all in need of a savior and all in need of Messiah to make this whole thing come clear. In the meantime, love Elohim and keep the commandments and test to the limit the traditions of the elders from wherever they come. Especially when hanging around a tree were told to not eat the fruit from. Come quickly Yeshua!! I, like probably most readers of this blog, came out of Christianity recently. I have probably distanced myself farther than most here though. I think evangelizing Jews is completely unnecessary and ridiculous. I understand from this that the new covenant is still in the future, and that it is identical to the current covenant except that mankind will be finally able to keep their end, when Torah is written within us and sin has been eliminated. Thus all of Israel is still under the Sinai covenant, and what made a Jew righteous and worthy of redemption in 1016 B.C. is the same in 2016. Jews have just as much faith in Messiah as you do, but they feel it would be premature to crown anyone Messiah who hasn’t met the requirements. If you think about it and are honest with yourself, your faith in Yeshua is conditional on his fulfilling these requirements at some time in the future. Not only did Christianity crown him Messiah, but also deified him, and made him a middleman through which all men must now approach the Father. Then from the earliest of the so-called church fathers you see vicious anti-semitism, leading to atrocities committed against the Jews by Christendom. Is it any wonder so few Jews, especially those who are Torah observant and know God’s word, ever convert to a belief in Yeshua? Do you actually believe a righteous Jew woke up one morning in 30 A.D. with a place in the world to come, but went to sleep that night damned to hell because Yeshua had been crucified that day? Shalom Mr. Leaver. I need to ask you from the start … have you ever met an Israeli/Jewish person who is eternally thankful that someone loved them enough to do something that you consider unnecessary and ridiculous … to share with them their need to out all their faith, hope, trust, belief, emunah … whatever word(s) you choose to use … in the Messiah of Israel, Yeshua? Have you ever met an orthodox young man whose father is a head rabbi in Jerusalem … and this young man comes to my friend’s house a couple times a week and says “Teach me more about Yeshua”? If you had experienced the things that my family and I have experienced, you would never be having this discussion … at least from the vantage point that you are presently. I do not have the time right now to answer all of your questions and concerns. You raise some “interesting” points … many of the same points that Judaism raises in order to try to make the case against Yeshua being the Messiah of all Israel. I wanted to focus on your following comment: “I think evangelizing Jews is completely unnecessary and ridiculous.” For starters, we need to define what you mean by the word “evangelizing”. Maybe you hold to the long held, accepted definition, that it means something like “sharing the Good News of Yeshua as the Messiah with someone who has not yet accepted Him as such”. Then again, maybe you have accepted this newer definition that says something like “forcing your views/beliefs upon someone … whether they want to hear it or not … and forcing them to accept the same beliefs”. Maybe you have come up with some variation of these two, or come up with something different. If you hold to the first … the one that is supported by Scripture … then I can say that you come across as someone who has not considered all of the Scriptures concerning Yeshua as the Messiah, and those who proclaimed Him as such. To say that it is “unnecessary and ridiculous”, to follow in the footsteps of all the apostles … John the Baptist, or Yochanan the Mikveh Man, if you prefer … and the Messiah Himself … well, I can’t help but say you are in serious error, and you are following in the footsteps of Judaism, and not the King of the Jews and His followers. Tom, I take you at your word when you say you don’t advocate forced conversion, so I don’t have that definition in mind. I just doesn’t make any sense to me, particularly when the Jeremiah 31 promise of the new covenant very clearly and plainly indicates the new covenant is still in the future and is tied to the messianic age. If the Sinai covenant is still in place what justification is there for suddenly pulling the rug out from under a Jew who has faith in and a personal relationship with God and is doing his best to obey Him? What justification for a momentous change that suddenly places a middleman between him and God, with the threat of eternal punishment for failure to recognize this change? Just think about the implication of Jeremiah 31:31-34. Even the author of Hebrews realized the new covenant wasn’t actually here when he wrote “what is obsolete and outdated [meaning the Sinai covenant] will soon disappear” just after quoting this passage from Jeremiah. It seems obvious that because Yeshua continually said things like “The kingdom of God is at hand”, like many others the writer of Hebrews anticipated the swift return of Yeshua to set up the messianic kingdom. But here we are going on 2,000 year later and it still hasn’t happened, and the new covenant remains a future promise. Mr Leaver, do you disregard the rest of the Tanach and Brit Chadasha, and only abide by Torah for instruction and doctrine? I’m trying to figure out why you would ask for a concept to be proved from Torah when it was very clearly stated by Yeshua Himself – the living Torah. If you don’t believe the words of Yeshua and the rest of the Scriptures, then obviously this conversation needs to begin on a totally different level! Besides that, your reference is to Jews who have “faith in and a personal relationship with God and is doing his best to obey Him” … what about the MAJORITY of Jews who are secular and don’t care about a relationship with the Creator or even think of obeying Him. Where does this leave them? [Deu 4:2 ESV] 2 You shall not add to the word that I command you, nor take from it, that you may keep the commandments of the LORD your God that I command you. [Deu 12:32 ESV] 32 “Everything that I command you, you shall be careful to do. You shall not add to it or take from it. So no, I cannot reconcile a requirement to have faith in Yeshua as the Messiah, because I have yet to find any such instruction in Torah, or Tanakh for that matter. It doesn’t matter that Yeshua said it, because I don’t believe Yeshua is/was YHWH, or a deity, or part of a trinity, and I expect anything said or done by Messiah to be perfectly in line with Torah. [Deu 13:1-5 ESV] 1 “If a prophet or a dreamer of dreams arises among you and gives you a sign or a wonder, 2 and the sign or wonder that he tells you comes to pass, and if he says, ‘Let us go after other gods,’ which you have not known, ‘and let us serve them,’ 3 you shall not listen to the words of that prophet or that dreamer of dreams. For the LORD your God is testing you, to know whether you love the LORD your God with all your heart and with all your soul. 4 You shall walk after the LORD your God and fear him and keep his commandments and obey his voice, and you shall serve him and hold fast to him. 5 But that prophet or that dreamer of dreams shall be put to death, because he has taught rebellion against the LORD your God, who brought you out of the land of Egypt and redeemed you out of the house of slavery, to make you leave the way in which the LORD your God commanded you to walk. So you shall purge the evil from your midst. A. Someone gives a prophecy. B. The prophecy comes to pass. C. The prophet leads you into idolatry. B. Hasn’t happened, evaluation stops here. No need to even proceed to C because this hasn’t come true. So why do you doggedly hang on to Yeshua as Messiah when by all standards given throughout the Torah he isn’t? You have faith that he WILL fulfill the messianic requirements at some point in the future, but why? What reason is there, just because he said so? Okay, so when he accomplishes it then you can crown him Messiah. No need to do it prematurely, because there is no Torah command that you crown someone as Messiah who hasn’t met the requirements, nor that you are required to “believe” in a “potential” Messiah. I hear what you are saying and understand, but do not necessarily agree. Let me explain. Suppose a group of people were given a puzzle with no box/picture. Is it probable they would figure the picture out at varying stages? Maybe some more clearly than others? Likely, even those who had most of it figured out would not perfectly ‘see’ the picture until finally assembly and would need adjustments along the way. While some may not be able to see it yet, I do believe not only the Yeshua is the Messiah, but that He is clearly portrayed in the Torah on multiple very detailed levels. But, in His wisdom, Hashem has withheld parts of that picture from Judah so the He might display His glory and fulfill his promises both to Judah and to Ephraim. Without getting too long-winded (I’m on my cell thumb typing) search my blog for studies on the Memra, Joseph, the Angel of the Lord, etc… These and others are topics I have covered in detail demonstrating with amazing clarity that Yeshua fits the picture. But, as you do correctly point out, there is unfinished business. We happen to be at the amazing point in history where we see the two story lines coming together heralding Moshiach Ben David! I’m just trying to show the reasonable and logical perspective that I think Judaism has on this, one which I myself have adopted as the only one that makes sense in light of what Jeremiah 31:31-34 tells us about the (still future) new covenant, and what seems to me to be an absurd idea that a Jew still under the Sinai covenant had everything turned upside down on him without warning in 30 A.D. by a potential Messiah who didn’t/hasn’t fulfill(ed) the messianic requirements. Sir … when I say that “Jewish people need to be converted”, I am using the terminology … the English word that we have in our Bible … our Tanak. No, the word “convert” is not in the Torah, if you are only talking about the first five books. But it doesn’t take much of a Bible scholar to realize that the Hebrew word that is translated as “convert” in Isaiah, is the same word that is used in the Torah, 181 times. Check out “H7725”. Isaiah is the one who said this … although I have to imagine that he used some form of the word “teshuvah”. However you want to translate it, the message is still clear. The children of Israel, under the command of Moshe, needed to be converted from their sinful ways. Isaiah said the same thing … along with numerous other prophets. Yochanan said the same thing … so did Yeshua. Why do you have a problem with me quoting Scripture? And why do you have a problem with me using the same wording that YHWH used … Moshe, Isaiah, John and Yeshua? I will give you one verse from Torah, if that is all you need. Deuteronomy 18:15 says … A prophet will YHWH thy Elohim raise up unto thee, from the midst of thee, of thy brethren, like unto me; unto him ye shall hearken. Yeshua is that prophet. He has fulfilled “too many” of the prophecies concerning Him, that there is no logical way for Him not to be THAT prophet … THE MESSIAH. You need to listen “Shema Yisrael” to Him. Question 1: I need to ask you from the start … have you ever met an Israeli/Jewish person who is eternally thankful that someone loved them enough to do something that you consider unnecessary and ridiculous … to share with them their need to out all their faith, hope, trust, belief, emunah … whatever word(s) you choose to use … in the Messiah of Israel, Yeshua? Question 2: Have you ever met an orthodox young man whose father is a head rabbi in Jerusalem … and this young man comes to my friend’s house a couple times a week and says “Teach me more about Yeshua”? Answer 1 and 2: I do in fact know Jewish people, both personal friends as well as those who I don’t personally know but have published their stories via the written word or video. To say that had I witnessed such, (as I have), I wouldn’t be having this conversation is a bit of a stretch. You see, I myself believed Yeshua to be Messiah for 40 years, but when I finally got off my lazy rear end and started looking for truth, and found Torah, and realized that if my faith was somehow a continuation of the ancient faith in the God of Abraham, Isaac and Jacob, that the Bible must be a progressive revelation from God, and the NT must be in agreement with Tanakh. So when I contemplated Jeremiah 31:31-34 for example, realizing that the new covenant that Christianity believes has already come, is still in the future, and I realized that the Sinai covenant is still in effect for the Jewish people, it became obvious that Torah/Tanakh says nothing about putting one’s faith in Messiah for salvation (with the lack thereof damning one to hell), and that what made a Jew righteous between Sinai and 30 A.D. could not have changed. That’s changing the terms of the covenant. Question 3: Why do you have a problem with me quoting Scripture? And why do you have a problem with me using the same wording that YHWH used … Moshe, Isaiah, John and Yeshua? Answer 3: This is simply a non sequitur. You want to argue that conversion in your view is equal to Teshuvah. But that’s not what you believe. You believe conversion for a Jew is accepting Yeshua as Messiah and trusting in him for salvation, which is now unavailable to him outside of Yeshua. While the word translated convert in the KJV in Isaiah 6:10 is not Teshuvah, it seems to have the exact same meaning. Teshuvah has always been part of Atonement. I have absolutely no problem with Teshuvah. But that’s simply not what you mean by conversion. Was this fulfilled? Christians come up with various mechanisms to deal with this, saying his transfiguration was his “coming in his kingdom”, or it was an invisible, spiritual “coming in his kingdom”, etc. But the plain reading clearly suggests there were 2 or more people in the group he was speaking to who would be alive when he returned and would SEE him coming. It is inescapable that Yeshua has not fulfilled the Messianic requirements. If you really dig into the truth, you’ll find that he didn’t fulfill nearly as many prophecies as you might think he did. Take Isaiah 53 for example. Messianic and Hebrew Roots folks are constantly talking about rabbinic writings predating Yeshua that understood Isaiah 53 to be messianic, and yet if you really dig into it, you’ll find out it isn’t so. See http://nojesus4jews.weebly.com/sophiees-blog/category/isaiah-53 for many fascinating insights on this. Believe in Yeshua as Messiah if you will. I’m not trying to take that away from you. I just wanted to present my take on why it is logical and reasonable that Jews aren’t going to accept someone as Messiah who hasn’t fulfilled the messianic requirements. When I came out of Christianity I told myself I had to follow truth wherever it led. I questioned everything, including Yeshua, and I simply came to the conclusion that it is untenable to insist that 1300+ years into the Sinai covenant suddenly the terms of the covenant relative to atonement were changed to include faith in a middleman for salvation, and damnation for continuing to be lawful and observant but failing to accept the requirement of faith in a messiah who isn’t actually messiah per the definition. Mr Leaver, despite your attempts to be “logical”, it appears that you are making quite an error in logic yourself. Most, if not all, of the Biblical prophets foretold events that have not come to pass even yet. Daniel’s temple, Zachariah’s Sukkot, Isaiah’s lion and lamb, Malachi’s fathers and children, to name a few. And yet they are still considered prophets. To state that because Yeshua gave a prophecy that has not yet been fulfilled, He does not meet Torah requirements, you must also, for the sake of consistency, reject the rest of the Biblical prophets that have unfulfilled prophecies … at least until they come to pass. I’m not aware of any Scriptural instructions on WHEN a prophecy must come to pass in order for it to be considered true or false. Therefore your use of Deuteronomy 13 is not applicable, especially since Yeshua did speak “prophecies” that came to pass and furthermore, He never led His followers into idolatry. I understand that many Jewish people believe that He did, and when conversing with a Jewish person who wants to know about Yeshua, this is one of the first points to make clear: He did not create a new religion based on the worship of idols. In closing, I hope that you will reconsider the “reasonable and logical perspective that you think Judaism has on this” and realize that there are thousands upon thousands of Jewish people who find this perspective very unreasonable and illogical … all because they have discovered that Yeshua is the Messiah, foretold by the prophets in Scripture, and that life with Him can never be compared to life without Him (and yes, that includes Jews who were very devout and lived a life centered around Torah and obedience to God). Despite your Christian background, it appears that you have never experienced this, or else you could not say the things that you have. If you truly knew Yeshua, you would not have to “wait and see” if He is the Messiah because you would know in your heart that He is, beyond any shadow of doubt. My prayer is that you will be able to come to this place … in the meantime, Shalom! To be Messiah one must complete the messianic requirements, no? You believe Yeshua WILL BE Messiah. You will say he IS, but ultimately you believe he WILL BE in the future. Do you believe one must have faith in Yeshua to be saved? If you do, then do you believe it’s logical to believe that in 30 A.D. with Yeshua’s crucifixion, the Jew who woke up that day righteous was suddenly damned to hell without faith in Yeshua?